Just last week we announced that Stanley Steemer’s Tile & Grout Cleaning Service is now Certified asthma & allergy friendly®. Now they’ve gone a step further to earn Certification for their Hardwood Floor Cleaning Service as well! Now every floor in your home—carpet, tile and grout, and hardwood—can benefit from a Certified asthma & allergy friendly® professional cleaning service to reduce allergens and irritants from your home’s floors. Hardwood floors have crevices that regular mopping and spot cleaning can’t always reach. Common allergens like dust and pet dander can build-up in those nooks and crannies. However, Certified hardwood floor cleaning services—like Stanley Steemer’s—are scientifically proven to be more suitable for those with asthma and allergies. So when you see the Certification Mark alongside the Stanley Steemer name, you know their Hardwood Floor Cleaning Service passed rigorous testing. 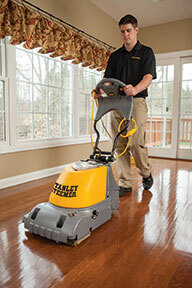 Stanley Steemer is the first hardwood floor cleaning service to be Certified. Their cleaning service is proven to remove an average of 96% of common household allergens from hardwood. To find more information about Stanley Steemer’s Hardwood Floor Cleaning Service and where to schedule a cleaning, click here.